I was eager to test my own tute again this past weekend (he, he). It's still working and still stinkin' cute! This time I used a soft corduroy for the main and accent fabrics (The pics don't show it very well, but the accent fabric is chocolate brown with pink polka dots. Super sweet!) 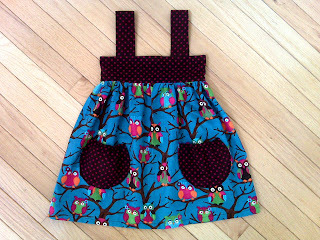 and added cute pockets to the front. The girls are in love with these pockets. They are just the right size for their little hands to have easy access and stuff all tons of things (crap) in them. The are almost full circles with elastic at the top. 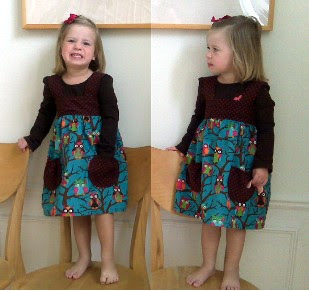 Aww...cute Cute CUTE!I love the fabric it's so perfect. 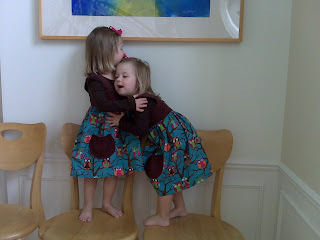 Your daughters are adorable.Mine were cute like that once...lol. LOVE these!! I am hoping to try these sometime this week...Amy put up a tutorial too...ya'll are SO inspiring! My kids LOVE pockets too, I will definitely be adding these! GREAT job!